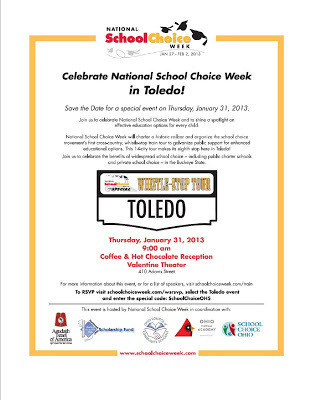 National School Choice Week is Jan. 27 - Feb. 2 and the Whistle-Stop Train Tour is getting ready to roll. From Los Angeles to New York, with 14 stops, the National School Choice Week Special will bring messages of hope and optimism from coast to coast. On January 31st, they will stop in Toledo to "celebrate the benefits of widespread school choice - including public charter schools and private school choice - in the Buckeye State." They will be at the Valentine Theater at 9 a.m. for a Coffee & Hot Chocolate Reception. 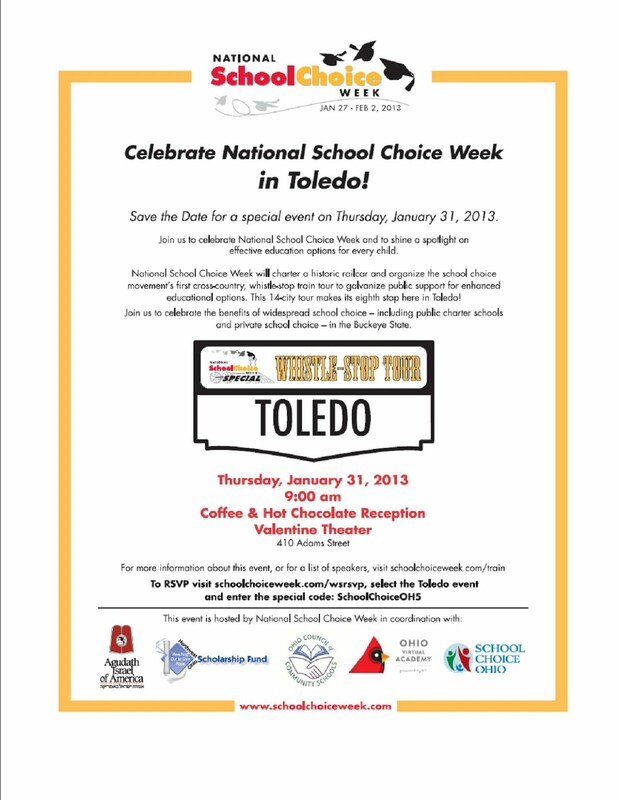 You can RSVP by sending an email to: toledo@schoolchoiceweek.com. National School Choice Week shines a spotlight on effective education options for all children. In 2013, more than 3,000 events, across all 50 states, will bring unprecedented attention to the need for, and benefits of, school choice. National School Choice Week's participants support a variety of different school choices for families — from high-performing public schools to public charter schools, private schools, magnet schools, digital/online learning, and homeschooling. Each special event along the National School Choice Week 'Special' route will focus on one or more of these essential components of school choice, bringing together a diverse, bipartisan coalition of groups and individuals who support school choice. We encourage members of the media to attend and cover these events, which will be filled with enthusiastic parents, students, teachers, and community leaders.